This Asian chopped salad is a crisp, fresh and filling. 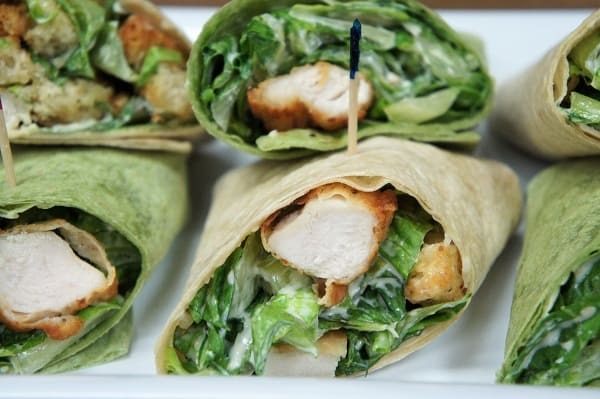 It’s great for lunch or a light dinner. Green and red cabbage are combined with romaine lettuce, carrots and green onions. Then the salad is topped with grilled chicken, toasted almonds, rice noodles and sesame seeds. It packs a bunch of flavor to keep you satisfied. 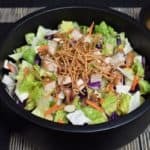 Serve the Asian chopped salad with a homemade sesame dressing that’s easy to make and delicious. 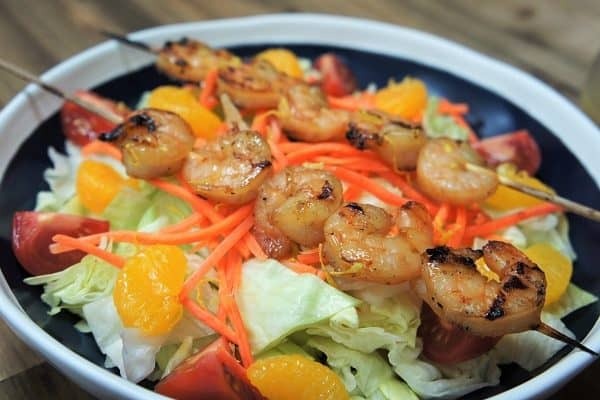 If you need more hearty and delicious salads, try this grilled chicken Asian salad, this citrus shrimp salad or this grilled chicken Italian salad. Enjoy! Add all of the sesame dressing ingredients to a small jar, or a container with a tight fitting lid. Cover the container and shake vigorously to mix. Refrigerate until ready to use, stir vigorously before using too. You can add the sliced almonds to the salad without toasting, but toasting the almonds really brings out their flavor and adds a little extra crunch. Place the almonds in a non-stick skillet over medium heat; cook them for 5-6 minutes until they turn a nice golden color. Shake the skillet often and keep an eye on the almonds as they will go from golden to burnt in no time. As soon as they’re done, remove the skillet from the heat. Add all of the chicken marinade ingredients (except the chicken) to a bowl, stir to combine well and to dissolve the sugar. Place the chicken breast in a large, re-sealable plastic bag. Add the marinade to the chicken. Remove most of the air from the bag and seal tight. Make sure the bag is properly sealed and place the bag in a pan or on a plate, just in case it leaks (yes it has happened to me). Marinate the chicken in the refrigerator for at least one hour. Turn the bag occasionally to distribute to marinade well. Grill the chicken over moderate-low heat until the internal temperature is at least 165°F at its thickest part. When the chicken has cooled enough to handle, cut into small cubes. Add the green cabbage, red cabbage, romaine lettuce, carrots and green onions to a large bowl. Toss the ingredients until well combined. Serve the chopped greens into bowls. 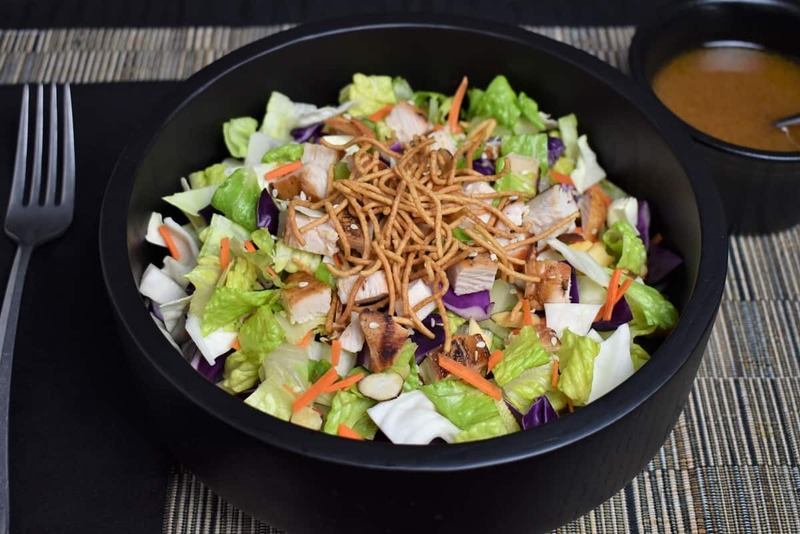 Separate the remaining ingredients into 4 servings and top each chopped salad with chicken, almonds, crunchy noodles and a sprinkle of sesame seeds. Serve with the sesame dressing on the side. 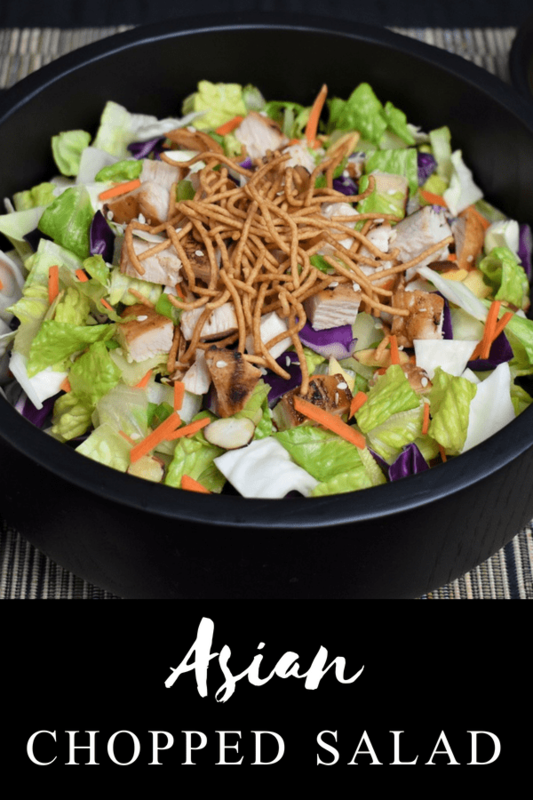 This Asian chopped salad is a crisp, fresh and filling. Place the almonds in a non-stick skillet over medium heat; cook them for 5-6 minutes, shaking the skillet often, until they turn a golden color. Add all of the chicken marinade ingredients (except the chicken) to a bowl, stir to combine well and to dissolve the sugar. Place the chicken breast in a large, re-sealable plastic bag. Add the marinade to the chicken. Remove most of the air from the bag and seal tight.